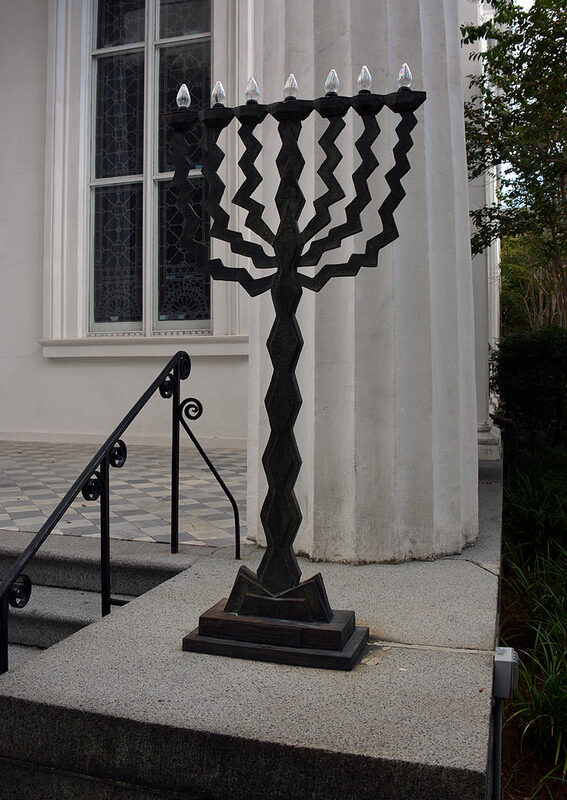 The Kahal Kadosh Beth Elohim Synagogue, a famous icon just off of Market Street, has a fitting place among Charleston's long list of historical churches and buildings as the county's second oldest Synagogue, and the oldest Synagogue that remains in continuous use. The Grecian structure, one of the many hallmarks of Charleston's blossoming 19th century architectural era, is more than enough to grab a passer-by's attention, but the astounding details within, including an ornate domed ceiling and walls of tastefully appointed windows, will surely take anyone's breath away. 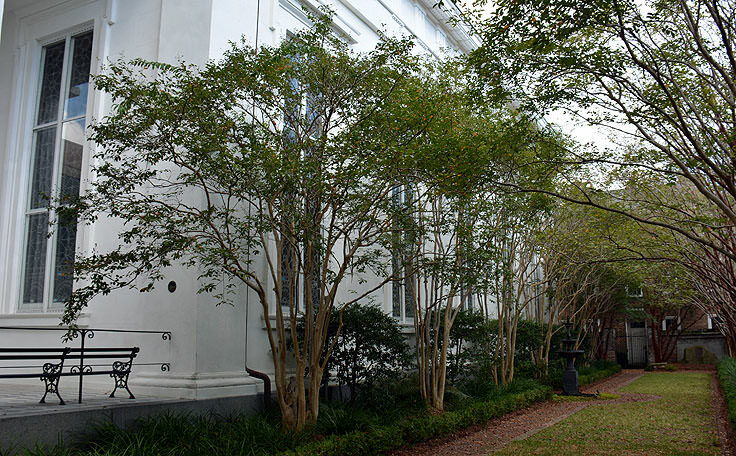 Still home to a vibrant, inclusive and caring congregation that holds regular services and stays connected to the Charleston community, the Kahal Kadosh Beth Elohim Synagogue is a perfect representation of how diversity and an inherent sense of historical pride have had an integral role in transforming Charleston into the legendary vacation destination it is today. 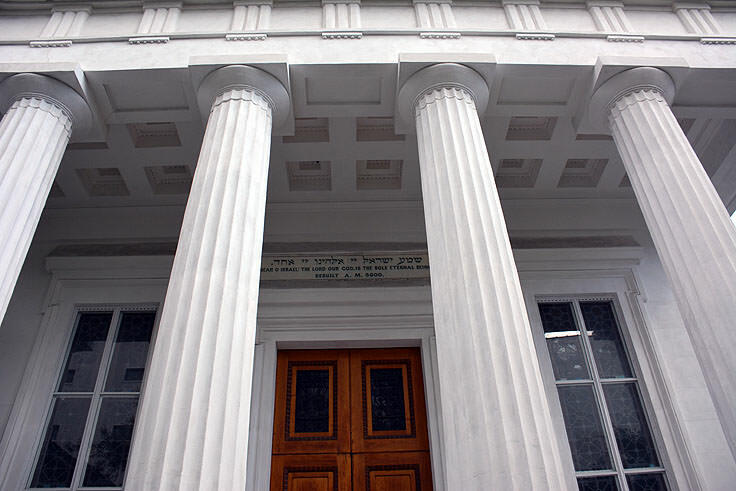 The congregation of Kahal Kadosh Beth Elohim, which means the "Holy Congregation House of God," was originally established in colonial-era Charleston in 1749. Founded primarily by Charleston Sephardic immigrants of Spanish and Portuguese descent, by the end of the century, the congregation had an astounding 500 members, making it the largest Jewish community in the country. The form, portico and rich ornamentation of the historic Kahal Kadosh Beth Elohim Synagogue are all derived from the design of classic Greek Temples and present a stunning facade, with six towering columns standing at the entrance, and an ornate interior that's protected by a perfectly crafted dome ceiling overhead. Shortly after the historic Kahal Kadosh Beth Elohim Synagogue was complete, the congregation made waves in history yet again by embracing Reform Judaism, and the first service held in the new temple coincided with this new transition, and reflected this ideology. This transition was not an overnight occurrence, as the Reform Movement began in Germany in the 1810s, and gradually spread throughout central Europe and to the American coastline. The major changes included choral singing, music generally provided by an organ, and the use of German (or the country's native language) instead of Hebrew for prayers and sermons, and in 1824, nearly 50 members of the Beth Elohim congregation petitioned the synagogue's trustees to embrace the reform, and conduct the Hebrew rituals, sermons and prayers in English. This initial request was denied, and the congregation effectively split over the issue, with 200 members supporting the new Reform Movement by 1933. This splintered off section of the original church was the congregation that held the first revolutionary service in the new temple, and effectively became the first American congregation to follow the Reform movement that had originated in Europe. 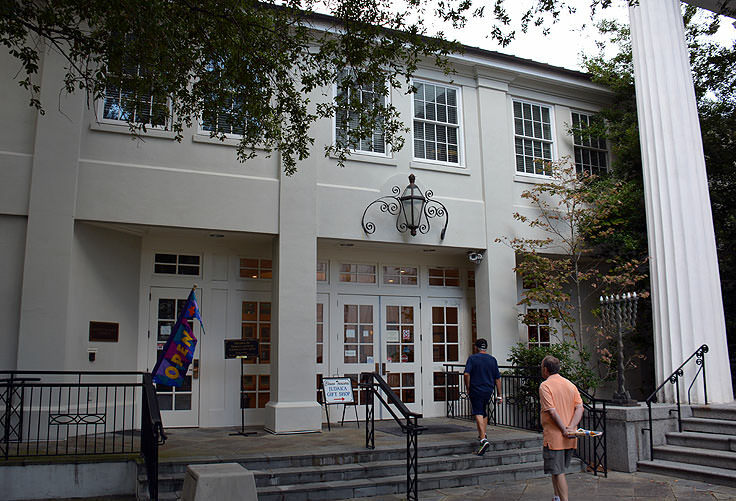 Today, the Synagogue still serves Charleston's Reform Judaism community, with an active membership that has been meeting at the Kahal Kadosh Beth Elohim Synagogue for generations. Regular Friday evening Shabbat service begins at 8:00 p.m., and the first Friday of every month is marked with a Congregational dinner at 5:30 p.m. (advanced reservations are required) followed by a Family Shabbat Service held at 7:00 p.m. In addition, a number of studies and community events are held throughout the year, aimed at young and adult congregants alike. 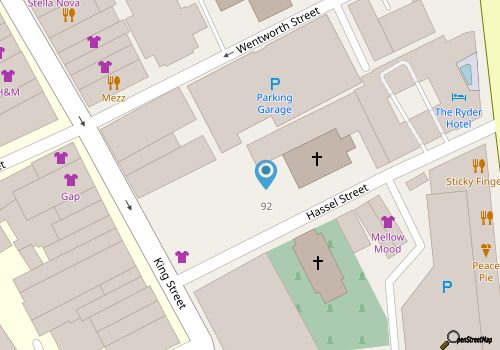 A complete list of upcoming events can be found at the Kahal Kadosh Beth Elohim Synagogue's website at http://www.kkbe.org/. The synagogue is also home to a small museum which contains treasured artifacts pertinent to the legendary history of the congregation, such as a personal letter written to the Kahal Kadosh Beth Elohim parishioners by President George Washington himself. 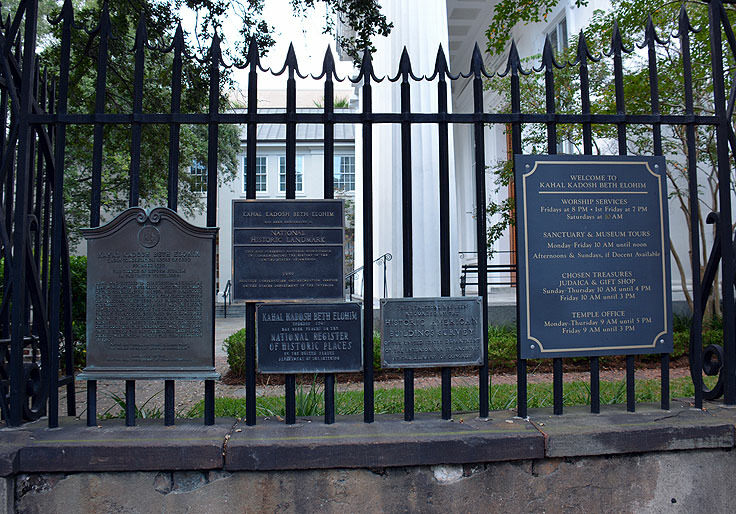 In addition, the Synagogue is located just 10 blocks away from the temple's Coming Street Cemetery, which holds the honor of being the oldest Jewish burial ground in the Southern United States. Kahal Kadosh Beth Elohim Synagogue is open for tours to the public year-round, Monday through Friday, from 10:00 a.m. until 12:00 p.m. A gift shop is also located on site, and remains open until 4:00 p.m. to the public. Visitors who want more information on visiting the site, or booking a special event including a wedding, Bar/Bat Mitzvah, or Brit Ceremonies can call the temple directly at 843-723-1090. A remarkable site along Charleston's historic district, and a history-making landmark for both its deep rooted congregation and the country in general, the Kahal Kadosh Beth Elohim Synagogue is a treasure in this South Carolina city. Distinctive for its Grecian temple in addition to its legacy as one of the oldest Jewish congregations in the United States, the Kahal Kadosh Beth Elohim Synagogue is a must see for any visitor who wants to soak up all of the historical "firsts" in all faiths that Charleston is known for, and experience this impressive legacy firsthand, both inside and out. Charleston, South Carolina is well-known as a city of "firsts," but one of the most remarkable first sites in this town is the toweringly impressive Dock Street Theatre. Located in the French Quarter of the Historic District, this well-renowned landmark, still operational and freshly back in business after a $19 million dollar restoration, has the distinction of being the oldest theater in the country - a title which it proudly honors by hosting a seasonal arsenal of plays to seasoned theater goers and Charleston newcomers alike.